1Natural Product and Polymer Chemistry Laboratory, Department of Chemistry, University of North Bengal, Darjeeling-734013, India. 2Department of Physics, University of North Bengal, Darjeeling-734013, India. 3Institute of Chemistry, Military University of Technology, 00-908 Warsaw, Poland. Multifunctional additive performance of poly acrylate in presence of selective liquid crystal structures were evaluated by standard ASTM methods. Homopolymer of mixed acrylate (octyl, decyl and dodecyl) was synthesised and characterized by thermo gravimetric, spectroscopy and viscometric methods. 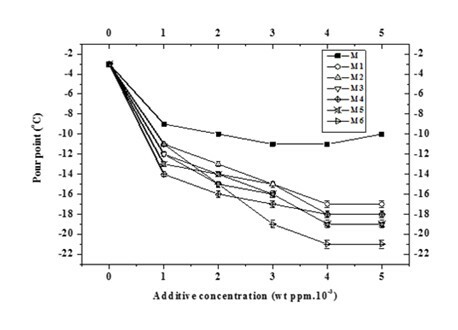 Additive performances of the polymer were evaluated as viscosity modifier (VM), thickening agent (TA), pour point depressant (PPD) and anti wear (AW) additive. Physical blend of the polymer with six different types of liquid crystals (LC) were also made and evaluated for their performance. The results indicated that all the LC-blended samples act as better VM, PPD, along with excellent AW and thickening performance compare to the pure polymer sample.
. Mortier R.M., Fox M.F., Orszulik S.T. Chemistry and Technology of Lubricants, Springer, Dordrecht.